Adam Savage (second from right) and Jamie Hyneman are bringing Mythbusters to an end after a 14-season run. Before Adam Savage became the charismatic half of Discovery Channel's incredibly successful MythBusters series — alongside stoic, mustachioed co-host Jamie Hyneman — he was building sets and special effects for movies like Star Wars, Terminator 3 and The Matrix. These projects pairing creativity, science and technology were not far from the work Savage would begin in 2002, when he and Hyneman began the 14-year MythBusters run that put every adage, urban legend and scientific misnomer to the test via the scientific method to famously confirm or bust each one. But next year, the beloved show that has brought fun, real-life science into the living rooms of millions comes to an end (the final season premieres on Jan. 9). 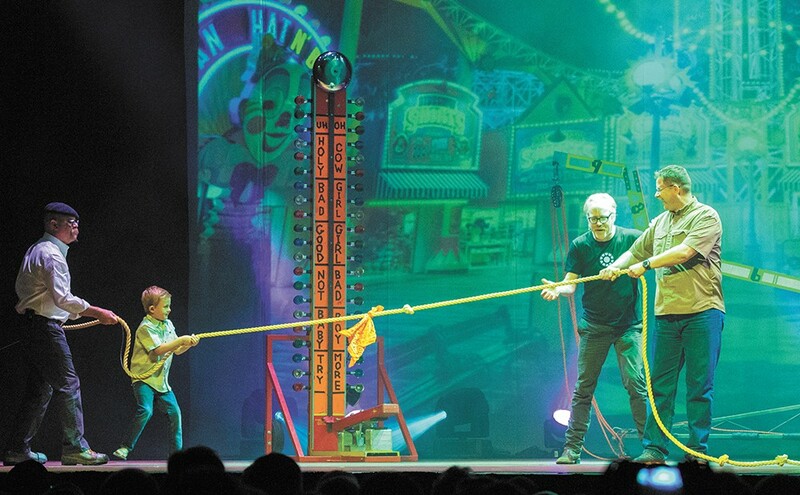 To commemorate the bittersweet finale, Savage and Hyneman have embarked on a cross-country tour of their live stage show, MythBusters: Jamie & Adam Unleashed!. As the duo traveled through the Arizona desert last week, we caught up with Savage to get his perspective on the series' end, what's next and what to expect on stage. INLANDER: What is the lasting legacy you hope MythBusters leaves behind after the show concludes? SAVAGE: It's not one I would have expected, but it's that science is creative. If you had shown me all of the success MythBusters was going to have at the beginning, I'm still not sure I would have seen that this is one of the most important messages, and the most important thing that I learned. But it is — science is often thought of as the opposite of creativity, and yet it is completely adjacent to it. How much science background did you have before the show, and how much of a science expert would you say you are now? Before the show I was a science enthusiast. I read lots of science stuff, and my favorite and most inspiring teachers were my science teachers. And yet, I had no formal training or background in it. And you know, when we started this job in 2002 I thought I was coming with some real skills, having spent years working in special effects. I now see I was a baby and had no idea. The education I got in this — I now consider myself a "gentleman scientist" — it has fundamentally altered the way I think about things. Are there any experiments you didn't do on the show that you wished you could have? No, not really. There is one famous one about Formula One race cars, that they have so much downforce that you can drive them upside down, but there is just no way we're ever going to be able to do that. In the last season we tackled a few pretty amazing stories that had eluded us up until then. What are people going to be most excited to see in the final season? I am really proud of this final season; I think the crew did a great job. I think the cinematography of MythBusters... it's one of the loveliest shows on TV. I also think I personally had more fun this season than I have ever had before. It was a great experience and I will sorely miss my crew. I hope to keep working with them on other things. Post-MythBusters, what will you do when you think of a myth you want to test out? Do you have a desire to test things for fun? I totally think so. It's in my nature, and I have been given this incredible opportunity to learn how to build robust methodology in order to come to conclusions, and I love doing that. When I cook, I absolutely do rigorous testing methodologies. I run through multiple iterations of things, and have gone through the objectively best way to cook sweet potato fries. To me that is an extra hour in the kitchen, but it's something I'll never forget. It's really, really fun, and I also get to enjoy sweet potato fries often. How does the format of the TV show translate to what you're doing on stage? It was tricky. We ended up with basically what ends up being sort of a magic show. We bring tons of audience members up and show them things to help them understand. It's all-ages, and it actually does get quite bombastic at times. It's also a chance for fans to really see what we're genuinely like. After all these years on the show, for us it's this great experience of a whole different way of storytelling, which I find very invigorating.